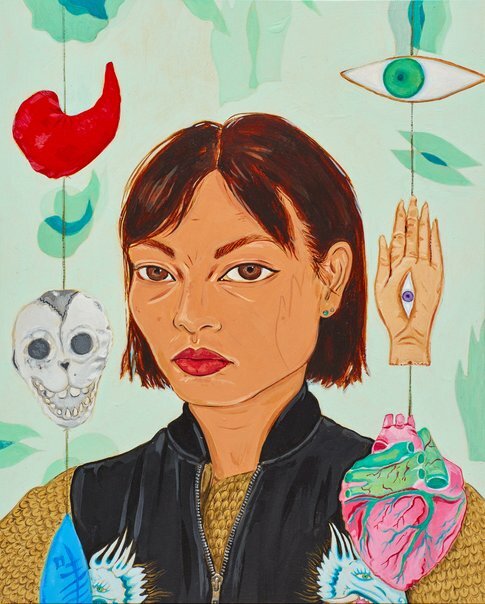 Kate Beynon’s practice often includes self-portraiture, informed by her interest in mixed cultural identity and auspicious imagery. In this work, the pose and direct gaze were influenced by Frida Kahlo’s self-portraits. The title relates to the symbols in Beynon’s work. They include an eye and hand of Guanyin, the Goddess of Mercy, denoting compassion. ‘The smiling skull refers to the cycle of life and death, and reminded me of Fulang-Chang, one of Frida’s beloved spider monkeys, while the sprouting, almost botanical heart is a sign of hope,’ says Beynon. Reflecting in the studio after an intense time working on several major projects, Beynon enjoyed painting in this smaller scale on wood. She wears a favourite silk jacket from her fashion collaboration with The Social Studio, Melbourne; the dragon heads acting as protective emblems. Born in Hong Kong, Beynon arrived in Australia in 1974. She has a Bachelor of Fine Art from the Victorian College of the Arts and is completing her PhD through Monash University. Beynon has participated in over 130 exhibitions and has been a finalist in the Sulman Prize, Portia Geach Memorial Award and Moran Portrait Prize and won the 2016 Geelong Contemporary Art Prize. A seven-time Archibald finalist, she was highly commended in 2010.